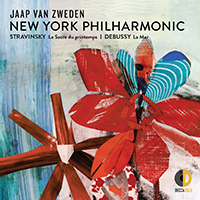 Music Director Jaap van Zweden will conduct the New York Philharmonic in Britten’s Violin Concerto, with his Dutch compatriot Simone Lamsma as soloist in her Philharmonic debut, and Shostakovich’s Symphony No. 7, Leningrad. The program takes place Thursday, November 29, 2018, at 7:30 p.m.; Friday, November 30 at 11:00 a.m.; and Tuesday, December 4 at 7:30 p.m.
Britten said of Shostakovich: “No one composing today has equal influence on me.” The two developed a close friendship, dedicating works to each other. A pacifist, Britten left England for the United States in 1939, in the middle of writing his Violin Concerto and four months before Great Britain entered World War II. The New York Philharmonic gave the World Premiere of Britten’s Violin Concerto in 1940 with Britten in attendance. Shostakovich’s Leningrad Symphony was premiered in 1942 during the Nazi siege of Leningrad at a refuge 1,000 miles away for Soviet artists, including Shostakovich. It was performed in Leningrad four months later by the surviving members of the Leningrad Radio Orchestra, broadcast through loudspeakers set up around the besieged city. Jaap van Zweden and Simone Lamsma are frequent collaborators, including in performances of Britten’s Violin Concerto. The Chicago Tribune wrote of their performance of the work with the Chicago Symphony Orchestra in 2014: “Lamsma … seized on the work’s angular rhythmic drive as commandingly as she did its lyrical intensity. Her tone remained piercingly beautiful even as she tore through the virtuosic gymnastics…. her deep feeling for the anxieties that lie beyond the notes sealed her success. Van Zweden proved himself to be a model collaborator.” Ms. Lamsma will perform the revised version of the concerto. The New York Philharmonic will offer an allotment of free tickets to young people ages 13–26 for the concert on Friday, November 30 as part of Philharmonic Free Fridays. Single tickets start at $31. (Ticket prices subject to change.) A limited number of $18 tickets for select concerts may be available for students within 10 days of the performance at nyphil.org/rush, or in person the day of; valid identification is required. The New York Philharmonic is offering an allotment of free tickets to young people ages 13–26 for the concert Friday, November 30 as part of Philharmonic Free Fridays; learn more at nyphil.org/freefridays. For press tickets, call Lanore Carr at the New York Philharmonic at (212) 875-5714, or email her at carrl@nyphil.org. Open Rehearsal — 9:45 a.m.
Friday, November 30, 2018, 11:00 a.m.
Tuesday, December 4, 2018, 7:30 p.m. Photography and video are available in the New York Philharmonic’s online newsroom, nyphil.org/newsroom/1819, or by contacting the Communications Department at (212) 875-5700 or PR@nyphil.org.